Strangers become New Friends, if only for a moment. . . . .
One Saturday in January 2013, we went to see the legendary Sun Temple in Modhera that dates from 1026 AD. There were groups of school children of all ages on a field trip on a Saturday! All through our time in India, we saw students on field trips on weekend, days off from school. They were learning about their faith, their culture, and their history. There was so much to see, bats in the dome, a man with a monkey, a thousand year old temple, but the students and adults were pushing to touch me and ask for a photo. I am telling this story because the video below happened to me thousands of miles from New York. I actually do speak to people on the street here or whenever there is close contact such as in an elevator. I was brought up to speak to people and I am very outgoing when I want to be. I have always enjoyed talking to people in line at the cinema , only for a few minutes and then they are gone. Everyone has a story. David always laughs that people are telling me made up stories, but who knows? It is fun for me. So this instant connection with Indian people who are very friendly to start with, was an easy transition. Especially if I looked someone in the eye, smiled, said hello or stuck out my hand to shake, it was immediately returned with warmth and a smile and often a request for a photo. We could understand why photos were snapped of the students but the two of us? But of course we always agreed to the photo as did most of the students. 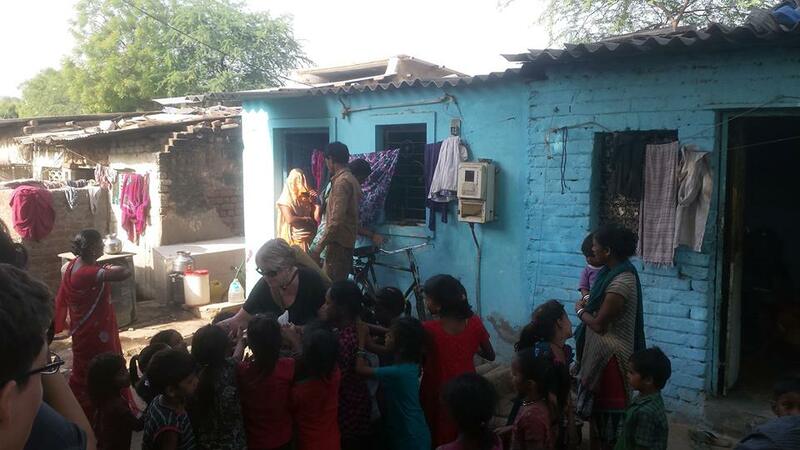 Here is a photo from our walking tour of the slum near Ghandi Ashram in Amdavad which happened one of the last few days of our time last year. I used an old teacher trick to win the children over. . . . .hard candy! I thought I would be overcome with emotion walking in the slum but it was a blessing to see the smiles and gentle souls welcoming us. Of course the candy was a hit even some adults enjoyed it. Honestly, the little sweet treat from me was a minuscule gift compared to the joy they gave me in return. Now after all those words of my story, I do know that these brief interactions between strangers can touch and change people’s beliefs and possibly prejudice. Now having been in India for a total of 8 months over two semesters, I can’t know or remember all the people with whom I interacted, but I have their faces, smiles, acceptance, and yes love written in my heart forever. Watch and see what this video shows on the streets of New York City. It is possible. . . . . . . This entry was posted in Uncategorized, USA and tagged ancient Hindu temple, architecture, bringing people together, friends, gentle, Hindu temple, Indian architecture, Multiculturalism, New York City, photography, strangers, strangers become friends if only for a moment, welcoming Indian people. Bookmark the permalink. 5 Responses to Strangers become New Friends, if only for a moment. . . . .
Oh Aayuasi, you have brought tears to my eyes. I loved every minute of my time in India and with your beautiful people! I would go back in a “New York minute!” Hugs! Thank u !! 😀 loads of love !